The Eagles have a veteran offensive line that played together last year with the exception of right tackle Lane Johnson who sat out 10 games because of a PED suspension. Was that a sign they are happy with who they have in camp? Left guard Brandon Brooks was asked the same question about running backs learning the heels of their lineman. 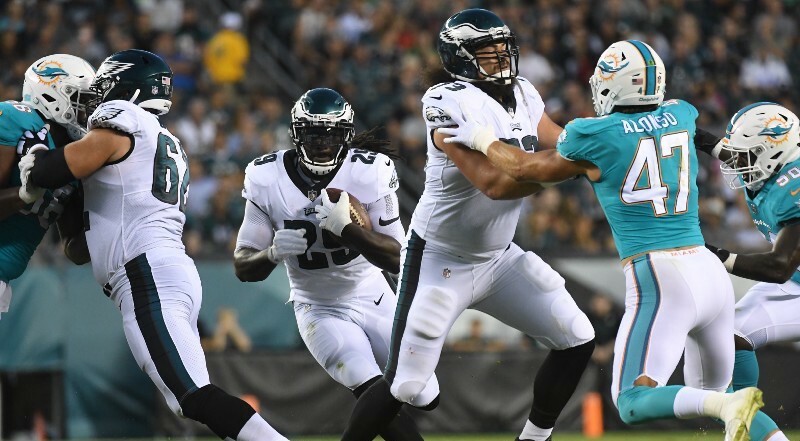 With all this talk about running backs and offensive linemen getting to learn each others’ steps, the Birds opened the preseason against the Green Bay Packers and ran the ball just 19 times for a measly 47 yards and no touchdowns on the ground. Pumphrey said he needs to learn more about his line and fundamentals. The Eagles gave him 11 touches against Green Bay and the rookie produced just 17 total yards. It wasn’t poor blocking on every play for sure. After four preseason games, Pumphrey has 26 carries for 49 yards, no touchdowns. The team has averaged just 3.12 yards per carry. It has to improve. Pumphrey has also fumbled twice, the team nine times, losing four.